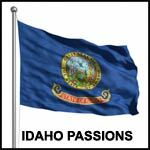 Born and Bred here in Idaho Ok, I am an Idahoan, I am also well traveled and there is no place on earth like here. I'm into mainly WWII and the Civil War history. Idaho born Love Idaho. Looking for someone who wants a love to last for a lifetime. Lets see were life leads.